A sunny evening in here tonight and some fish showed up! 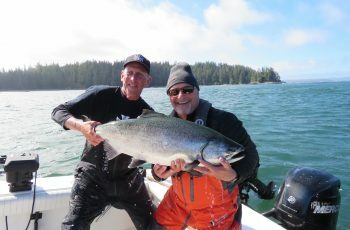 We had a tyee tonight, I am sketchy on the details, but the fish was taken on guide Paul’s boat, out at COHOE POINT. I will have pictures and a story in the next blog. That said, we had chinook on the WEST SIDE as well as the EAST SIDE today, the first day of our new trip. Today was productive for chinook and troll caught strong chickens. 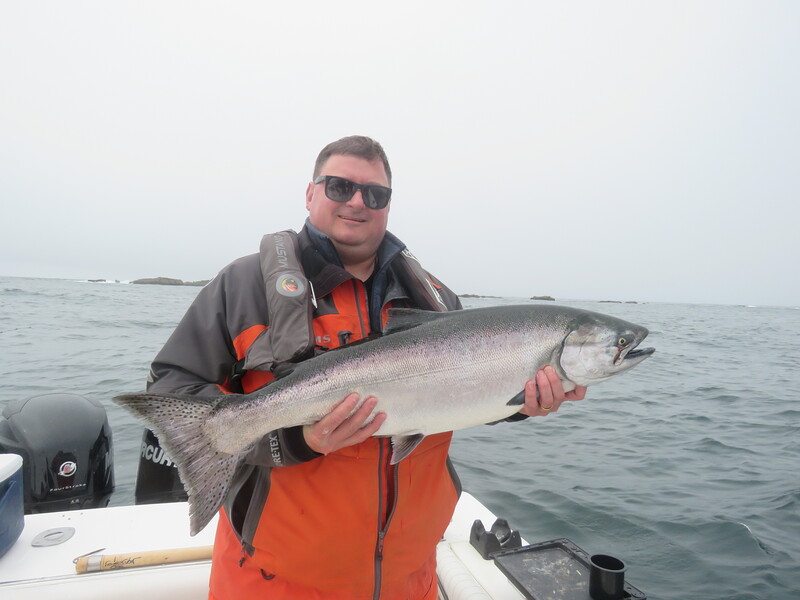 The guides that fished the outside waters all had halibut as a bonus, most over 100 cm. 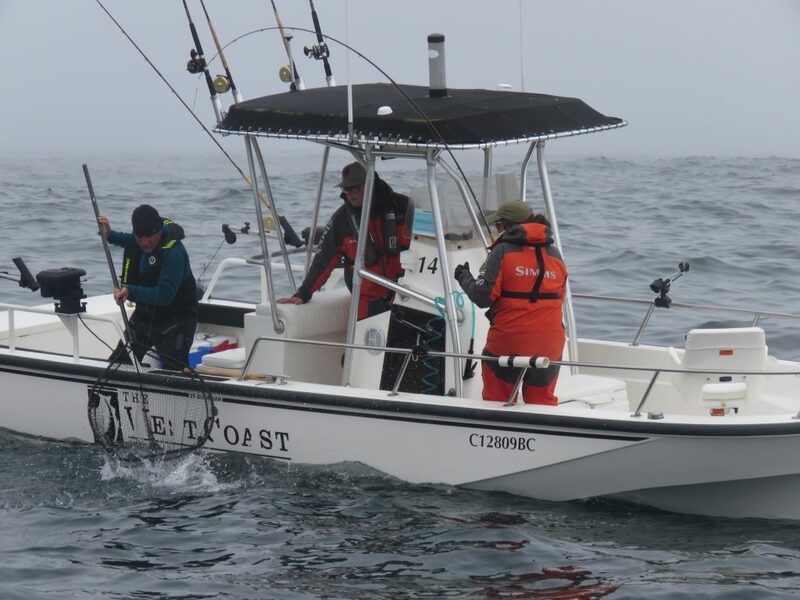 I personally released three halibut in that range as our boat easily had our limit to 33 lbs. 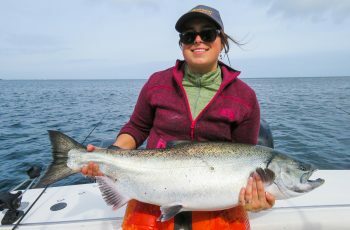 Our top chinook was 20 lbs. Looks like some good fishing ahead on this current trip. 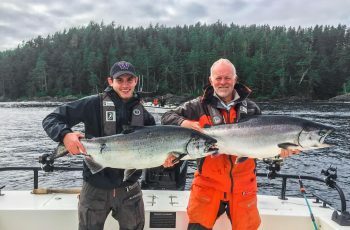 Our last trip was co-hosted by Derek Nyrose and it was a special event trip for Father’s Day, with prizes for top chinook each day. I know the largest fish taken in the fun derby was on Nathan’s Boat, for Ken Konkin, weighing in at 27 lbs. We should have some interesting pictures and video obtained from a fly-in photographer, that will be posted on our website in the coming weeks. For now, here’s a photo of the Father’s Day Trip host, Les Stroud – Survivorman & his son, Logan. Logan & Les Stroud – Survivorman with their catch. 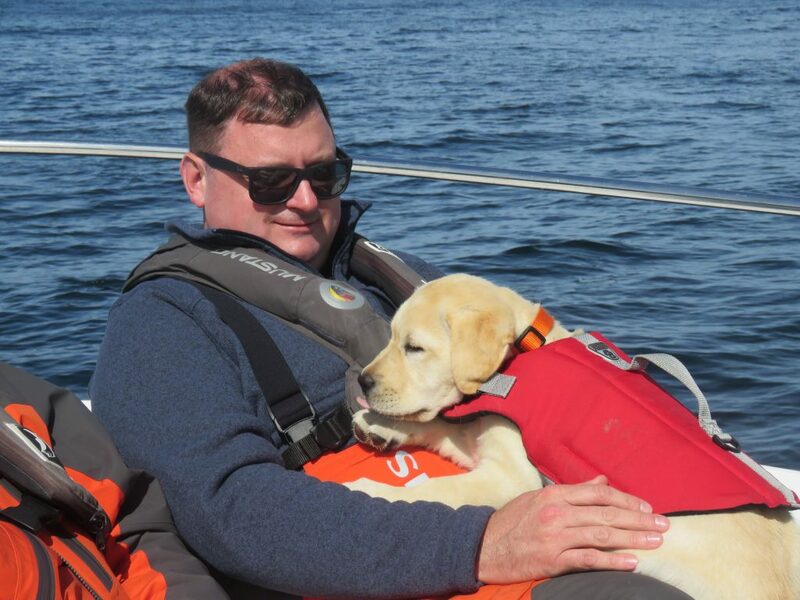 Les hosted the Father’s Day Trip. I personally was guiding Jacob Forman and Kevin Torpy. We struggled as most boats did in finding the chinook, although our last afternoon we got on a patch and caught as well as released plenty chinook into the high teens and retaining a 21 lber. Below are some pics of the boys with their chinook. The weather was awesome, although the fog bank rolled in, thank goodness for the GPS. 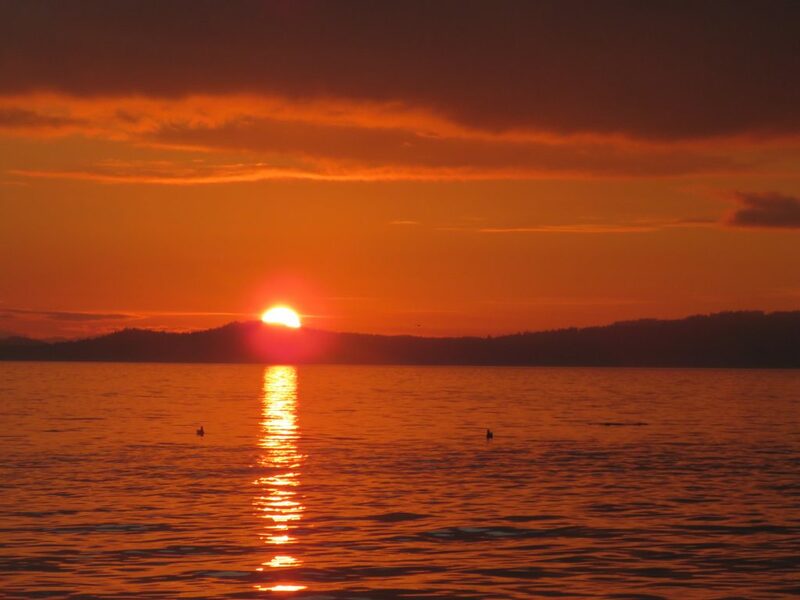 We ended our trip on a high note, funny how a hot afternoon can change everything. 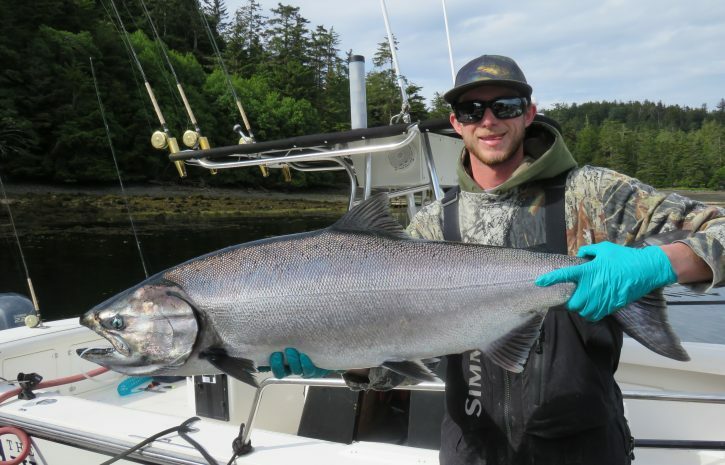 Kevin Torpy buckled on a nice chinook. 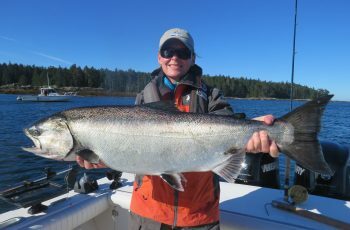 Kevin and his 21 lb chinook. 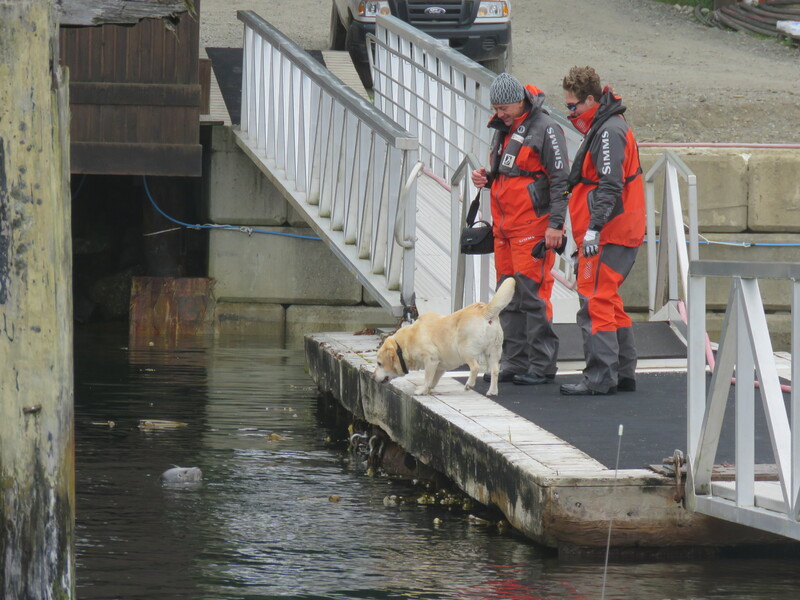 Meanwhile, Chelsea pictured below kept the seals in order, one of her favourite pastimes down at the dock. Chelsea earning her keep, chasing seals away from the docks. We overall had two days of grinding. Pictured below is my therapy dog Lucy, helping pass the time between bites , entertaining my guests. Therapy dog Lucy entertain my guests when the bite is off! Simon was fishing the Weston’s, and had a good last outing. 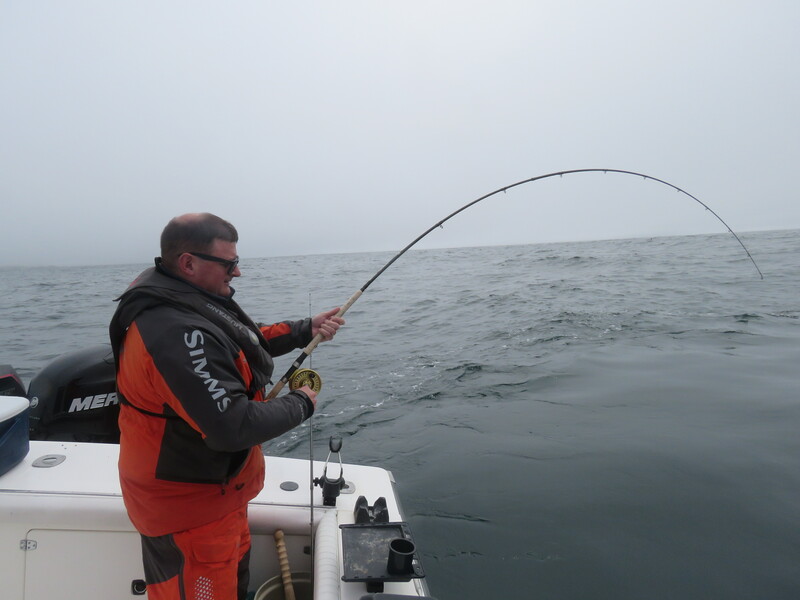 Pictured below is Simon on a nice chinook, successfully pulling off the net job. Simon slipping a nice fish in the bag for the Weston’s. The Westin’s with a take-home halibut. The trip proved to be a fun one, with Les Stroud – Survivorman entertaining us nightly with his stories and music. Sure the fishing could be better, but we did have decent weather and it was nice to see all the family’s up here fishing together. 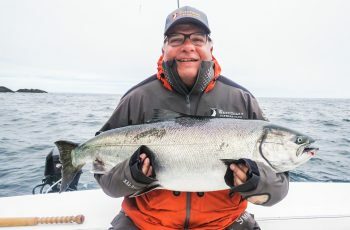 Bruce Langereis was fishing with his son, and had a great encounter with an orca whale. 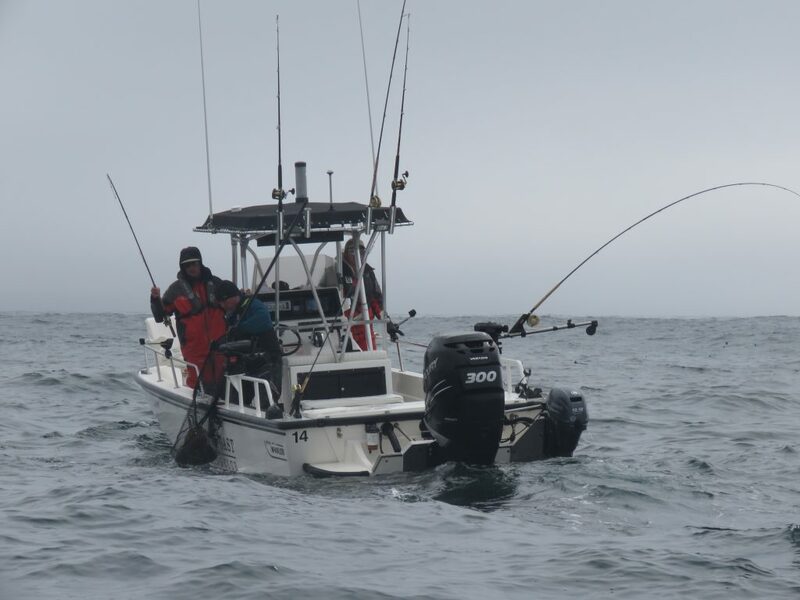 The whale chased his hooked fish right to the transom of his boat, attempting to devour it, and Bruce as well as guide Austin filmed the complete encounter. Check out the video below. The fishing has improved and we are all happy with that. The fish in most areas are shallow, top 50 feet of water. The down riggers are at this time more productive than the mooching rods dragging the eight ounces of weight. Of course we are all mooching cut plug herring. The halibut are somewhat plentiful for the guides trolling out west, many in the 20 to 35 lb range. As well the weather smartened up. The big swell has abated out west, that will help immensely. We can now spread out and fish a larger area. Hopefully some larger fish move in, but at this point, its nice to see the greater abundance of mid to high teens. 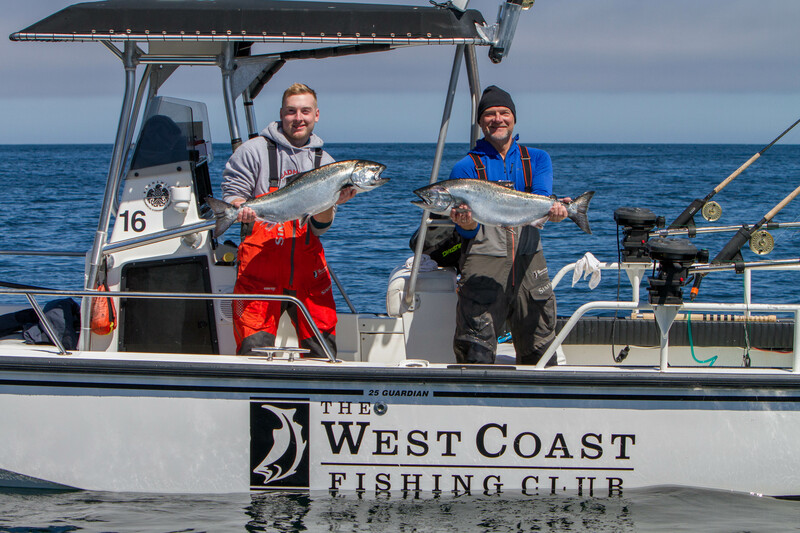 I am already looking forward to posting the next report, as the chinook fishing is now happening and all of our guides look forward to getting you into lots of fish. Thanks for checking in and good night from Langara.